Baby squirrels are not afraid of people. Or dogs. Or just about anything. If you follow me on instagram you may have noticed a video and picture of these two babies taking a nap on the stairs (badly in need of some paint) to our deck. Molly didn’t even know what to do with herself. 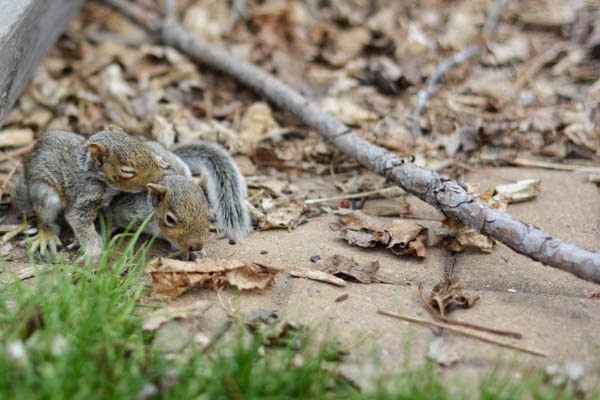 I carried them to a pile of brush out back (the wildlife lady said I could with bare hands, but that’s all kinds of nuts, so I used an old dishrag and scrubbed my hands like Lady Macbeth afteward) and eventually they scampered back to mom and the nest. Which thankfully wasn’t in the tree that toppled over during our first thunderstorm of the season and the only damage was to some plantings that will either come back or are pretty easily replaced. All kinds of counting my blessings this week. I haven’t been knitting. I don’t know if it’s the warm weather or just general burn out or the fact I haven’t watched much television in the last week (probably that one) but I just haven’t felt like picking up the needles. Happy Tuesday! What are you up to this week?